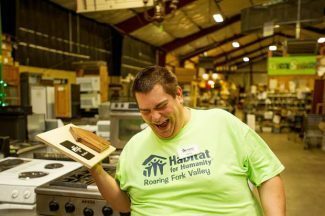 Brian Wilson broke into a big smile Wednesday when he was presented with Habitat For Humanity Roaring Fork’s “Most Enthusiastic Team Member” award for 2017. A smile comes easily for the 32-year-old and it’s apparent while visiting Habitat’s ReStore warehouse why he was chosen for the award. Wilson’s got a keen awareness of where everything is located in the cavernous warehouse between Carbondale and Glenwood Springs. He’s known as “King of the Appliances.” He accepts donations, rotates merchandise in the second-hand shop and occasionally assists shoppers. “I like seeing all my co-workers,” Wilson said.